In the wake of the Oct. 1 shooting, UNLV academics found new avenues for study. In the process, they’re helping our community explore the issues and heal from the trauma. The future of education is in programs — like UNLV's entertainment engineering and design — that reach beyond traditional academic disciplines to broaden the way students think. Here's how alumni of UNLV's unique program are marrying the creative pursuits of fine arts with the technical know-how of engineering. Marta Meana on her role as acting president. Jeremy Aguero, the 2018 Alumnus of the Year, on how to pay kindness forward. Communication Studies grad Sage Sammons is helping to spread the word of an improbable Stanley Cup finalist as the Vegas Golden Knights' director of communications. Plus: The Golden Pipes. Career Rifs. And the Kindness of Rebels. 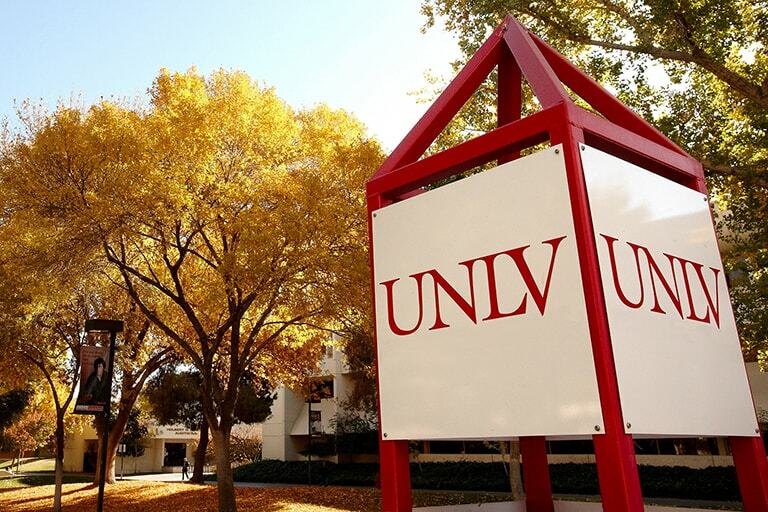 Rebels Give is a 1,957-minute fundraising challenge (in honor of the date of UNLV’s founding) that encourages the community to get involved and support high-impact campus programs. Hop on over to this Instagram account for a biologist’s take on science and art. A round up of news briefs from the fall 2018 issue of UNLV Magazine. Aspiring physician Kevin Ashi’s mission to solve global public health challenges is a path paved through life experiences, hard work, and a philosophy built on taking chances. Bill Speer, director of UNLV’s Math Learning Center, earns a national lifetime achievement award with his forward-looking approach to teaching math. From magic and witchcraft to building robots using Legos, these wild courses can put swordfighters in training and future presidents ready to deal with environmental catastrophe. Seven Rebels were signed by Major League clubs, and are starting to make their mark in minor league baseball. Posture — not screen time — is biggest factor behind neck and shoulder pain, UNLV study finds. Professor Michael Bowers on writing the essential textbook on Nevada's political scoundrels and budget battles. Women's Basketball Hall of Fame recognizes groundbreaking league as five players from the early days of the women's basketball program are honored. Myranda Bueno heads to her senior year fully recovered after missing month from taking pitch to the face. Shintaro Ban gets a taste of the U.S. Open as an amateur as he starts making plans to play as a pro. Funding from National Institutes of Health will support human genetics research, develop pipeline of scientists working to make Nevada a leader in personalized medicine.